At what cost housing supply? This push for more affordable housing in affluent city neighborhoods, because we like it there, is akin to the push for more suburban housing at the urban outskirts 60 years ago. “The demand is there! Accommodate our needs!” And that led directly to a disinvestment in cities from which we are only now beginning to recover from. I think this is an issue where it’s really important to distinguish between people and places. It is probably the case that, at least in the short term, capping housing supply in places like Lincoln Park makes it more likely that investment will move to adjacent neighborhoods – like, say, Wicker Park (or from Manhattan to Brooklyn, San Francisco to Oakland, etc.) – because once the number of affluent people who want to live in Lincoln Park exceeds the number of housing units allowed to exist there, some of those affluent people will have to settle for living nearby. This is called gentrification. Having been priced out of Wicker Park, white-collar workers are now moving to Logan Square, where they’ve driven up housing costs by almost 70% in five years. Is that the kind of economic development we want to promote? But just because a greater geographical area has become gentrified, however, it does not follow that more people have been given access to what Saunders calls “Global Chicago.” In fact, contrary to his argument, all of the research I’ve seen suggests that zoned caps on new construction are highly correlated with greater economic segregation. Which shouldn’t really be surprising. Under normal market conditions, homes should cost roughly what they cost to build or maintain, which is affordable to a broad majority of American households. (Obligatory caveat: the low-income will still need subsidies.) Moreover, there can be a variety of home sizes to appeal to different rungs of the income ladder. Zoned caps on housing construction essentially mean that in desirable areas, the housing market becomes like a big auction, where homes go to the highest bidders. And, just like in an auction, housing costs will be exactly as high as they need to be to price out everyone except for the people who can spend the most. Not only that, but the auction is often rigged against those of moderate income by specifying that more modestly-sized homes and apartments aren’t allowed to exist at all. 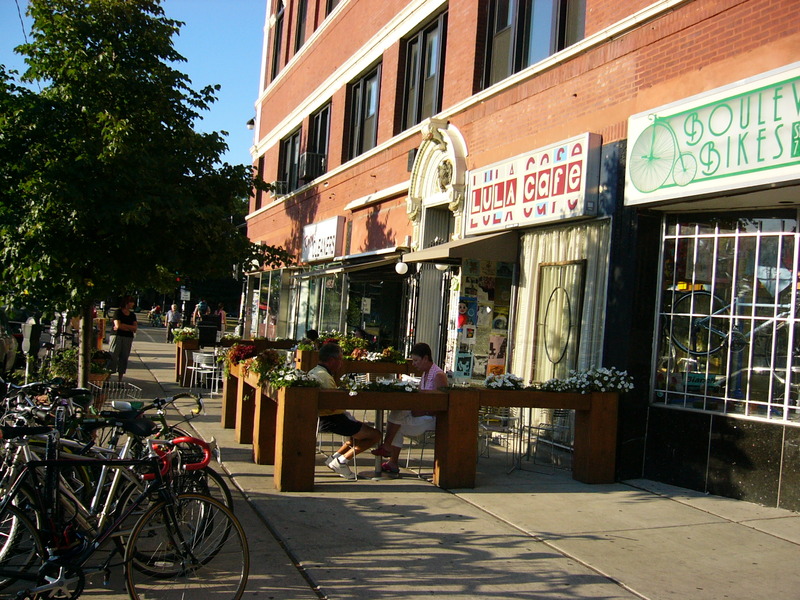 As a result, not only do currently-desirable neighborhoods stay segregated by income, but the adjacent areas – the Wicker Parks, the Oaklands, the Brooklyns – do, too. The transition from relatively low-income to homogenously upper-income can take place within the span of a decade, and once the process is complete, no one outside “Global Chicago” (or “Global NYC,” “Global DC,” etc.) has benefited in any meaningful way. The wall – as Pete elegantly wrote in another post – has simply been moved, and the people have been moved with it. I also want to push back on the idea that allowing more construction in desirable neighborhoods today is somehow analogous to the era of peak suburbanization in the second half of the 20th century. To be honest, I’m not sure what, exactly, the alleged parallel is. Although there was certainly lots of demand for moving to new suburbs, the particular way in which it happened was anything but the result of allowing people to live where and how they wished. To begin with, the devastating disinvestment that accompanied suburbanization was not simply a byproduct of allowing real estate demand to pool elsewhere, but of quite direct federal policy not to back home loans anywhere in the inner city. More importantly, though, the segregated character of those new suburbs was enforced by the very same exclusionary zoning codes that still exist today. That is, our current housing market isn’t some sort of break from the segregationist dynamics of the postwar era, to which zoning reform would return us: our current situation is operating under those same segregationist rules, from which zoning reform would (partially) liberate us. Remember, this is the story of economic segregation under our current zoning laws. Now, it’s true that loosening zoning caps, by releasing some of the incredible housing pressure in high-income areas, will also reduce the pressure to spread gentrification to other neighborhoods, at least in the short term. If your interest is in, say, Bronzeville becoming a more affluent neighborhood, one easy way to get closer to your goal is to make it illegal for anyone else to move into all the other popular neighborhoods around the Loop. Then, eventually, affluent people will move to Bronzeville because there’s nowhere else to go that’s closer to downtown. But if your interest is in giving more opportunities to the people who currently live in Bronzeville, you won’t have accomplished anything at all, since most of them will have to leave once affluence arrives and rents skyrocket up to Wicker Park levels. You’ll also have locked those people into a housing system in which you’ve sacrificed their mobility for the sake of inducing more gentrification. Essentially, you’re telling them that you have to keep housing prices really high in places like Lincoln Park – where maybe some of them would like to live, if it weren’t so expensive – because otherwise upper-middle-class people won’t choose to live in Bronzeville. Obviously, there’s some sort of balance to be struck here. Lots of people don’t want to move, and value their community because it’s their community, and we have to try to promote inclusive economic development in neighborhoods that need it. But I don’t think you can build an ethical housing policy on propping up lower-income neighborhoods by making housing elsewhere too expensive for their residents to leave. I don’t know what the answer is – here I’ll defer to Pete, who knows much more about neighborhood economic development than me – but I do know it can’t be that. I would hope, actually, that in the medium- to long-term, allowing more construction in desirable urban neighborhoods will benefit lower-income communities – at least ones relatively close to downtown – by bringing a larger share of the region’s jobs and amenities closer to them, and – crucially – making them accessible by public transit. Currently, the vast majority of Chicagoland’s jobs and wealth exist far, far outside the city center: by car, an extremely onerous commute for people who live in places like South Shore or Roseland; by public transit, they may as well not exist at all. Allowing development to reduce that imbalance should to benefit those communities. But obviously that’s not enough. Though I’m firmly on the side of allowing people to build where they want to build, and to live where they want to live, it would be absurd to imagine that zoning reform will single-handedly fix the problem of urban disinvestment, poverty, and segregation. We need more. That said, all available evidence suggests that our current housing policies are part of the problem. They need to go. I think once you’ve split the hairs down to the root, you see that it’s two separate issues. One is preventing destructive gentrification that displaces long-time residents as a neighborhood becomes desirable. The other is re-rehabilitating already blighted neighborhoods. How do you make such a neighborhood desirable in the first place (beyond being cheap to live in, I guess) to spur a cycle of increased population and new development? I think that’s right, although I would describe the first issue not just in terms of gentrification, but as maximizing housing choice for everyone, and increasing access to jobs and other valuable amenities. I agree with Ogro’s point that preventing gentrification and revitalizing blighted neighborhoods are two separate issues. Also, I think that Pete’s argument is different from encouraging gentrification to promote “trickle-down” urbanism. As he said, “I don’t believe we should be talking about expanding the global core at its margins. We should be talking about expanding development throughout the city.” Currently, the number of neighborhoods in Chicago that appeal to young people (especially middle-class whites) is small, as is evident from Pete’s map of Global City Chicago. He was talking about increasing the number of neighborhoods that are desirable for young people and including neighborhoods such as Austin and South Shore that are unlikely to benefit from a trickle-down effect. In my opinion, if more wealthy people moved to neighborhoods like South Shore, it would increase affordability in the already desirable neighborhoods as well as fight concentrated poverty, since it would take pressure off the Global City Chicago housing market. In other words, the “housing shortage” is a problem of the small number of desirable neighborhoods as well as the low density of the already desirable neighborhoods. Admittedly, the question of how to attract young people to segregated, high-poverty neighborhoods that are far away from the urban core is difficult, but it is worth the consideration of urbanists. I think that’s not the intention of Pete’s argument, but I think that’s the result. I’m completely on board with trying to attract more investment to places like Austin and South Shore – but I don’t think you get there by encouraging economic segregation in already-desirable neighborhoods. I’m a bit surprised that “the vast majority of Chicagoland’s wealth” exist far outside the city center. It’s a fairly centralized city, at least as American ones go. Retail and service jobs (including, things like doctor’s offices) exist are dispersed where people live, they’ll always be a long commute for some, but people generally don’t commute far for those types of jobs. Well, I guess it depends what you mean by “vast majority.” But it’s a lot – you should check out wherewework.org. You can see that, in fact, lots of people on the South Side do commute to suburban or far north side jobs. Neat link! I wonder if anything similar has been done for other cities? Yeah, it’s amazing, as is the team that made it. As far as other cities, I have no idea.